Here again!? That's good! This is the Living Room. Have a seat. There... *Hands you a scroll* Scroll down to look at the new Items I've added and renovations I've done to the house. Updated the Info page too! Yes, I did the changes, thanks to those people to mailed me to complain hahaha... sorry folks! It's just that i had no time to do nothing bout it.. but finally i did! hahaha!! Visit my improved West Wing - Other Manga's Fanfiction! 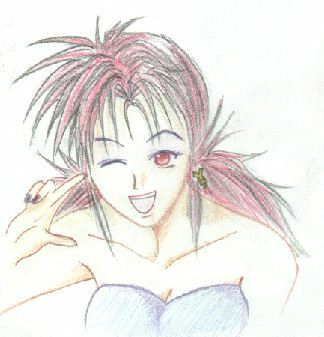 check out some of the fanfic there and read a manga I did a while ago. On complain, i had changed most, if not all Mitobans to Midou Ban or Ban in the pages. I think that's some update hahaha... see you next time! Also reduced the size of "A Wet Pose"
I already corrected the link to the "Get Backers - Character Info and Synopsis"!! Phew, after a long undying moments of work, I finally have time to update. - What is the Case? And I added another page to introduce our characters and some info about the manga in the main page. Ban : What the #$@% do you think you are doing?? Don't you know how to knock?! Bulma : Can I bring the camera too? 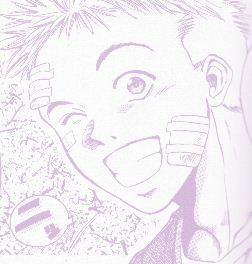 Seems like Ban and Ginji are 'happy'... ^__^ you can come and go as you want. Did you enjoy your stay? Tell them!